PRIMABOINCA is a research project that uses Internet-connected computers to search for a counterexample to some conjectures. This project concerns itself with two hypotheses in number theory. Both are conjectures for the identification of prime numbers. The first conjecture (Agrawal’s Conjecture) was the basis for the formulation of the first deterministic prime test algorithm in polynomial time (AKS algorithm). Hendrik Lenstras and Carl Pomerances heuristic for this conjecture suggests that there must be an infinite number of counterexamples. So far, however, no counterexamples are known. This hypothesis was tested for n < 1010 without having found a counterexample. The second conjecture (Popovych’s conjecture) adds a further condition to Agrawals conjecture and therefore logically strengthens the conjecture. If this hypothesis would be correct, the time of a deterministic prime test could be reduced from O(log N)6 (currently most efficient version of the AKS algorithm) to O(log N)3. VotKA : (Visualization of the k-means Algorithm) a project of the course Visualization in the Master’s studies of Computer Sciences at the RheinMain University of Applied Sciences. 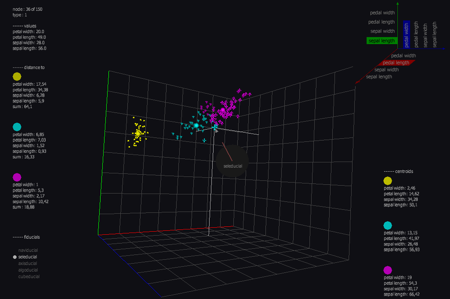 This project is a 3D visualization of the k-means algorithm applied to Fisher’s dataset. The user can interact with the visualization via reacTIVision/Fiducials or the OSCRemote application on the iPhone/iPod Touch. In VotkA users can interact with a three-dimensional cluster analysis visualization via a Tangible User Interface (TUI), the iPhone app OSCRemote or both in parallel. The TUI is provided by a small box that is technically based on Seth Sandler’s cheap multi-touch pad (you can see the box in the youtube video at the end of this article). On top of the box fiducials from reacTIVision are being tracked. Whenever a fiducial is being recognized a TUIO message with the fiducial’s id, position and rotation will be sent to VotkA. In terms of the cluster analysis the k-means algorithm has been implemented. The underlying multivariate data that is being visualized is Fisher’s iris dataset. In this dataset different aspects of iris blossoms are being stored (e.g. petal length/width, sepal length/width). Within the visualization this data is being dispersed in a cube according to different aspects (e.g. on the x-axis petal length, on the y axis sepal width and on the y-axis sepal height). The implemented visualization methods 3D scatter plot (see figure), scatter plot matrix / Grand Tour have been slightly adjusted to visualize Fisher’s dataset. The interaction with the Grand Tour visualization method is being carried out in the TUI with a real cube, which incorporates the projection of the three-dimensional data on the dimensional layers in the graph. By tilting the cube in the application the appropriate projection side will be displayed on the screen. When interacting via fiducials an additional sound feedback mechanism has been provided by converting TUIO messages in VotkA to midi signals that are being sent to a software sequencer. Midi channels are mapped to fiducial ids and midi signals are produced according to position and rotation of the fiducials. Actually it should not have been necessary to convert TUIO messages in VotkA to midi because reacTIVision supports both outputs, midi and TUIO. However, only one output channel at a time can be handled by reacTIVision. Proof of concept implementation of AKS for the cell processor (CBE). TimeTube : In an analytical laboratory, the scheduling of which assays are analyzed in which order and on which laboratory resources is a good example for a task that cannot be solved by a computer system alone. A computer system implementing scheduling algorithms, however, can be used to support the laboratory staff in order to find suitable schedules serving in a sense as an intelligence amplification tool for the human user. For this, the user interface is crucial and we employ a novel visualization technique we call TimeTube in order to enable the user to easily grasp the current state of the scheduling process and to facilitate decisions on how to optimize the schedule. In order to interact with the 3D visualization that we have conceived, a pen-shaped force-feedback device, the commercially available “Phantom Omni“, is used. It serves not only as a means for 3D input but is also able to provide haptic guidance. And it makes constraints on the schedule intuitively perceivable, by realizing a “haptic visualization”. We present a prototype system that implements the TimeTube technique and integrates it with a sophisticated scheduler. First test results show that completing tasks and navigating through time is intuitive for the users. As such, the system is a best practice example for a problem solver that takes advantage of the strengths of humans and computers.